To say John Quagliariello had a busy college experience would be an understatement. Not only is he completing requirements for two undergraduate degrees with three six-month co-ops in just five years, he did so as a Division I student-athlete. John will receive bachelor of science degrees in sport management and business administration with a major in accounting this spring. But completing his degrees won’t give him much time to relax. His busy lifestyle will continue as he heads to Harvard University Law School in the fall. John grew up outside of Philadelphia in Springfield, Pa., and came to Drexel as a sport management major and member of the varsity swim team. His father, also named John, graduated from Drexel’s engineering program in 1986, but John says his father didn’t push him to choose Drexel. It was joining the Drexel swim team that made the decision for him. John has been swimming since he was 7 years old and was a two-year captain in high school. At Drexel, he competed in the 100 and 200-meter backstroke. While he says he is disappointed in his collegiate performance, he did qualify for the US National Championships in 2014, where he competed in the 100-meter event. He also received a number of academic awards during his athletic career, including the CAA’s Commissioner’s Academic Award and the Scholar Athlete Award in his final year. Academics have always been a priority for John. It was in planning his freshman year schedule that he noticed a number of classes required for the sport management program were offered through LeBow. He thought it would make sense to see if he could plan a schedule that would allow him to get degrees in both business and sport management. He worked with advisors from both programs to identify the classes that overlapped so he could fit his coursework into just five years. Of course this meant taking 18 to 20 credits per term along with his practice and competition schedules. In this planning, he made sure that his co-op experiences reflected the cross-discipline nature of his academic coursework. He completed his first in the recreation department at the University of Pennsylvania working with athletic facilities, and his second was in the accounting department at Sunoco. 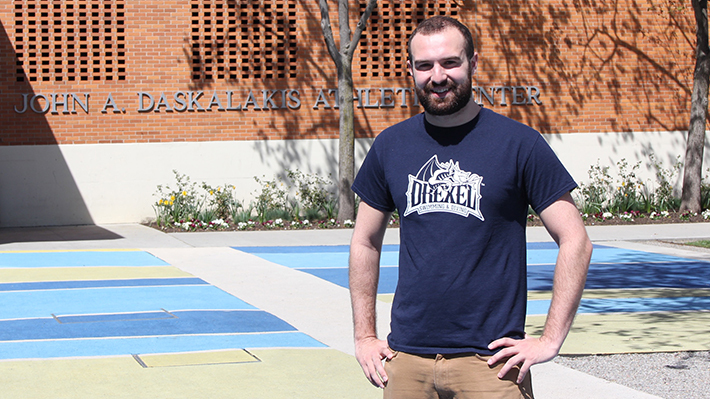 For his third co-op, he was able to split the experience and work as a compliance officer in Drexel Athletics for the spring term, where he continued to work in his fifth year. He also completed a 12-week tax internship with Grant Thornton during the summer. It was during his accounting co-op at Sunoco that he started to explore the idea of pursuing his law degree. His long-term goal is to work in collegiate athletics, ideally in an athletic director role. He sees his combination of studies as ideal for this career path. “I feel that having a business degree underneath me as well as sport management degree is really going to help me out with any challenges I might face,” John says. He hopes adding a law degree to his background will make him even stronger in pursuit of this goal.